The Defence Secretary Michael Fallon has today announced the next wave of 25 school cadet units, taking the government closer to its target of 500 in schools across the UK by 2020. 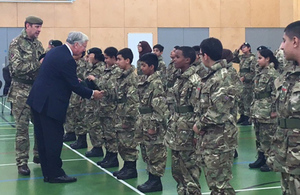 Defence Secretary Michael Fallon has today announced the next wave of 25 school cadet units. Amongst the schools included in the announcement today is Rockwood Academy in Birmingham - a former so-called ‘Trojan Horse’ school that has been turned around, removed from special measures and is now a rated a good school by inspectors. The school, previously called Park View Academy, is one of a number of state schools to open a cadet unit, under the Government’s Cadet Expansion Programme (CEP) backed by £50 million of additional funding. The programme is targeting schools in less affluent areas to ensure everyone has access to the full cadet experience. Research shows children who have been Cadets increase their academic achievement and decrease anti-social behaviour through an improved attitude, improved school attendance and classroom behaviour, and have higher self-esteem, self-confidence and organisational skills. These new school units will help young people to get on in life, raising their aspirations and motivating them to succeed in their education. With the schools approved today focused in areas of high deprivation, this is part of our plan to build a country that works for everyone. The response from both pupils and their families to the launch of our Combined Cadet Force unit has really been overwhelming and we are confident that the students will benefit significantly, as will the teaching staff. Since the day I set foot across the threshold of this academy my sole drive has been to improve the education of our students – Initiatives such as these will undoubtedly help us achieve our vision.